Golden Star Liners Of Jamaican Pride Oh what a few gold medals can do for an individual, for a team, for a nation and for the world…!! There’s no question that Olympic mania is still the flavour globally, months after the tremendous feat of certain individuals who took the world by storm…. Hurricane Ivan and Gustav had nothing on these guys. 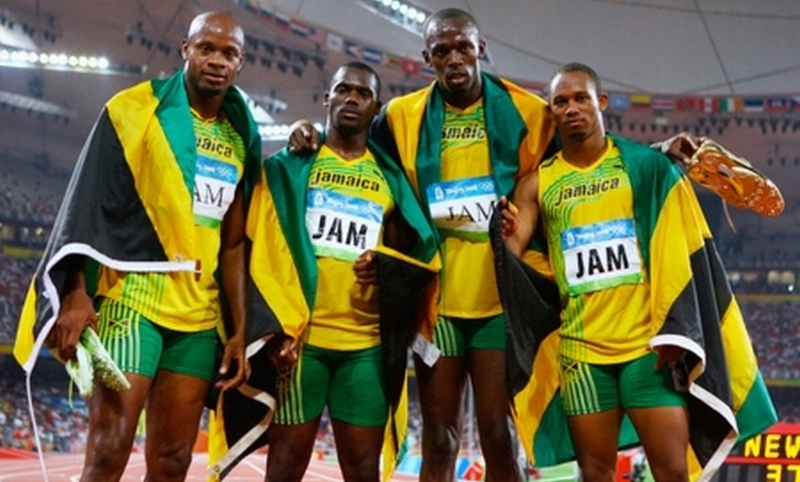 Although regarded as a ‘track and field powerhouse’ in international athletic circles over the years, up until now, Jamaica had not really made their superior presence felt but, come the Beijing Olympics, they set the record straight and made certain that their dominance reigned supreme throughout the Bird’s Nest. Just prior to the Games, the stage was uniquely set for extraordinary things to happen as the world’s two fastest men were jostling for pole position. The women were posting season’s best times and overall, the cream of the sprint world was looking to break out… big time. Nuh Linga – It’s A Dancing Ting As with almost everything that Jamaicans do, music plays a very big and important part and so, it was a done deal that many a Reggae artist would rush to ‘big up’ the athletic track stars in song by producing memorable cuts in their honour. It was Mavado who pipped the long line of eager artists doing their bit for hero and country with ‘We Going, (We Going, We Garn)’, his tribute to Asafa. And, when Usain showed di world how to do di ‘ Nuh Linga and ‘ Gully Creepa’ dance moves made popular by Elephant Man, it wasn’t long before all and sundry was on the case. Veterans like Cocoa Tea did one for the ladies, Shelly-Ann and company whilst (the UK residing) Dennis Alcapone ‘ toasted Bolt’. The now infamous ‘ archer pose’ of the one Usain was quickly coined as ‘ The Lightening Bolt Dance’ by renowned dancer Ding Dong and had the entire Jamaican population in turmoil as they watched the gold medal exploits of their champions. Usain Bolt If anyone had any doubts as to who the fastest man on the planet was, their questions were emphatically answered back in August in the heat of the rising Eastern sun amidst the glee of tens of thousands who helped a ‘ little known native’ from ‘ the land of wood and water’ bask in the glory of ultimate sprinting excellence. Usain Bolt was crowned ‘ king of the sprints’ and with that, his popularity soared beyond all proportions. Favourable references to ‘ superman’ immediately rang out around the world as Bolt totally devoured and destroyed the sprint records …!! The history books were sorely dented on three occasions as the world witnessed something absolutely breathtaking. Will life be the same for the man who conquered all..?? I don’t think so… what with his magnetic charisma, flamboyant persona, crazy dance moves and all, ‘ Lightning Bolt’, the name currently on everyone’s lips, is taking it to the world…!! Born in Trelawny, Jamaica on 21 August 1986, Usain grew up with his parents, Jennifer and Wellesley Bolt, his brother Sadiki and sister, Christine. He spent his time playing cricket and football with his brother but, none of those sports could contain him. As we all know, he holds the Olympic and world records for the 100m (9.69s), the 200m (19.30s) and, along with his team mates (Powell, Frater and Carter), the 4x100m relay at 37.10s, all set at this year’s event in Beijing. Bolt became the first man in history to set world records in all three at a single Olympics. And, for those of you who were under the false impression that our man ‘ appeared from nowhere’, those in the know will tell you that Bolt had previously collected the 200m gold medal at the 2002 World Junior Championships making him the youngest ever gold medallist…. we call that progression. But don’t for one minute think that’s where it will stop for the man with the golden spikes… we predict (as most of you do) that he will clean up and lower all his records in the 2009 season…. Yep, exciting times lies ahead. Asafa Powell But what of the supporting cast…. or should I say the co-stars who played their part just as amicably..?? Asafa Powell is the other name currently on people’s lips as he (we firmly believe) is responsible for providing the vital motivation that had brought out the ‘ rough and tough’ competitive nature of Bolt enabling him to rise to the top. Of course, Powell held the 100m world record for three years (between June 2005 and May 2008 with times of 9.77s and 9.74s). And, although many had tried to wrestle the record away from him, it was only his compatriot Bolt who was able to do it. So, you can imagine the tussle on the dusty race tracks of rural Jamaica where only the fittest of the fit survived (literally). We only got to see the end result but, there must have been many an informal track meet where the ‘ Bolt v Powell’ scenario played out. Powell ran the anchor leg of the 4x100m relay and many feel that it’s through his dogged efforts that the gold medal and World Record was achieved. He ran the distance faster than any sprinter has ever done…. his split time was recorded at 8.70s… so, although he may not always figure in the individual major races, he can run faster than anyone else on the planet…. when he’s ready to run. His personal best time in the 100m of 9.72s is the joint second fastest time in the history of the event…. no mean feat at all. Powell was born on 23 November 1982 in Spanish Town, in the parish of St. Catherine, Jamaica. He is the son of two ministers, Reverend William and Cislyn Powell who are co-pastors of a non-denominational church in Linstead. Whilst studying in Kingston, he had plans of becoming a mechanic before taking up running but, his elder brother, Donovan was a 100m semi-finalist in the 1999 World Championships and this had inspired him. The year 2006 was a great one for Asafa. Among his many accomplishments, he won ten 100m IAAF Grand Prix events; the Commonwealth Games 100m and 4x100m relay gold medals. He equalled his then World Record three times and, for his efforts, was awarded the ‘ Male World Athlete of the Year’ title. As far as the women are concerned, Veronica Campbell-Brown is the premier track and field sprint athlete. She ranks alongside Bolt as his equivalent being the most successful Jamaican female… having won all three levels of World competition from Youth, Junior to Senior level. She has fittingly made up for the disappointments of Merlene Ottey in claiming the elusive golds in the short sprints of the majors but, has a very long way to go to top Ottey’s overall tally of silver and bronze medals (the most claimed by any female athlete in history). 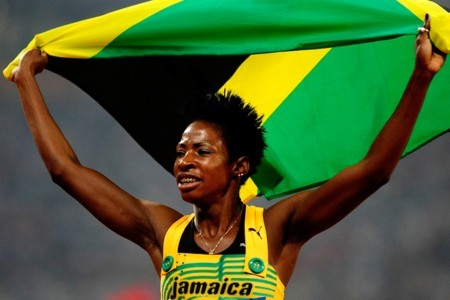 Although residing in the USA, unlike Ottey who eventually defected to Slovenia, Veronica is proud to represent her country, competing internationally in the Jamaican colours. A five-time Olympic medallist, she is the reigning Olympic 200m and World 100m champion. In Beijing, she ran the seventh fastest 200m ever (21.74s) and became the second woman in history to win it twice, successfully defending her title. But it’s never been easy for Veronica and one feels that her efforts would be rewarded even more (with some of the glamour afforded to Bolt and Powell) if she could break the seemingly obscure world records (100m and 200m) set by Flo-Jo under ‘ shady circumstances’ twenty years ago. Veronica was born to Cecil Campbell and Pamela Bailey in Trelawny, Jamaica on 15 May 1982. It certainly looks like Trelawny (with its rich heritage of yam and sweet potatoes) has the formula for world class sprinters..!! She attended Vere Technical High School in Clarendon before pursuing higher education in the USA. In 2007, she married Omar Brown, a fellow 200m sprinter. 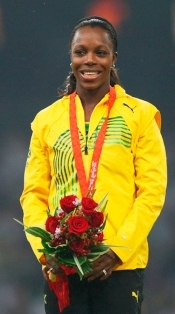 Shelly-Ann Fraser was born on 27 December 1986 in Kingston, Jamaica. She is the reigning Olympic champion over 100m (10.78s). Although Ottey, Grace Jackson and Juliet Cuthbert had tried for years without success, Fraser who, trained for the Olympics with team mate Asafa Powell, became the first Jamaican woman in history to win an Olympic gold medal in the 100m sprint. In an historical final, the Jamaican sprinters finished in the top three positions in the race with a photographic tie for second place by Sherone Simpson and Kerron Stewart (also a 200m bronze medal winner). Surprisingly, both women copped silver medals but, one wonders why that wasn’t the case when Ottey was tied in a dead-heat with Gail Devers back in 1996 where Ottey only got silver and Devers crowned champion, walked away with the gold medal. Ironically, Fraser’s Olympic time was the second fastest 100m ever recorded by a Jamaican woman, a mere 0.04 seconds shy of Ottey’s 10.74s national record yet, Fraser is the one who owns the gold ring and boasts champion status. And, she could have come away a double Olympic champion had the relay team not messed up the baton exchange in the final. 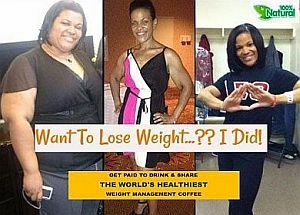 Melaine Walker was born on 1 January 1983 in Kingston and is a past student of the St. Jago High School. She is one of two Jamaican female hurdlers to have secured Olympic success, the other being Deon Hemmings who managed the feat in 1996. Walker won the 400m hurdles gold in a new Olympic record time of 52.64s. Shericka Williams claimed a notable silver medal in the 400m flat beating Sanya Richards (a Jamaican now residing and competing for the USA) into third place. 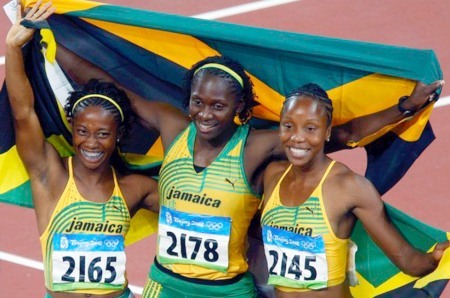 She also won a bronze medal in the 4x400m relay with Shereefa Lloyd, Rosemarie Whyte and Novlene Williams. Born on 6 October 1982 in Manchester, Jamaica, Michael Frater is noted as the third best Jamaican sprinter thus finishing third behind Bolt and Powell in the Jamaica National Championships. His personal best time of 9.97s, set in Beijing, saw him finish 6th in the 100m final. But he would claim a gold medal and world record when he ran the second leg of the 4x100m relay. He recorded a split time of 9.01s for his leg. Michael attended the Texas Christian University in Fort Worth, USA. Nesta Carter was born on 10 November 1985 and follows Frater in the roll call of Jamaican sprinters. Carter has seen recent successes in Germany and Brazil, winning both 100m races there. He is coached by Stephen Francis (Powell’s coach) and is associated with the MVP Track and Field Club. He completed the line-up in the gold medal 4x100m relay winning team alongside Bolt, Powell and Frater. The split time for Carter’s lead-off leg of the relay was 10.41s. Dwight Thomas also claimed gold as he ran in the heats. Jamaica Honours Their Heroes Two months after the Games in Beijing, seven days of celebrations (October 3 to 9) in honour of the outstanding performances of athletes began with a motorcade throughout the capital during which the country stood to attention hailing the men and women who had made them so proud. After a welcome reception at the Norman Manley International Airport where the athletes were serenaded, the motorcade travelled from the Harbour View roundabout along Michael Manley Boulevard to Port Royal and Duke Streets, Marcus Garvey Drive up Hagley Park Road, Hope Road, Trafalgar Road along Knutsford Boulevard onto Oxford Road and Tom Redcam Avenue onto Arthur Wint Drive and concluded at the National Stadium. Later the athletes were guests of honour of a fund-raising dinner at Strawberry Hill dubbed ‘ Dining with the Stars under the Stars’. 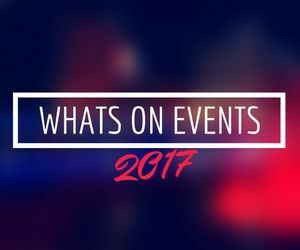 The Homecoming celebration moved into top gear the next day with a concert, National Awards Ceremony and a Sports Gala. National Awards were conferred on gold medal winners Bolt, Fraser, Walker, Campbell-Brown, Powell, Carter and Frater. On the Sunday, Judge Patrick Robinson signed copies of his book, ‘ Jamaican Athletics: A Model To The World’ and later, the National Heritage Thanksgiving Service was held at Emancipation Park. A VIP party was held in honour Bolt at the Quad (his favourite nightclub). On the Monday, the Olympians visited their former high schools. Campbell-Brown, Simone Facey, Aileen Bailey, Lloyd, Mardrea Hyman and Michael Blackwood returned to Vere Technical in Clarendon; Powell headed to Charlemont High in Linstead; Novlene Williams made the trek to Ferncourt in St. Ann whilst Fraser and Frater went to Marescaux Road and Heroes Circle to Wolmers. The motorcade rode West on the Tuesday heading out of Montego Bay for Falmouth where there was a sports gala and homecoming on the Wednesday at the Trelawny Stadium. The athletes were presented with keys to the city of Montego Bay in Sam Sharpe Square and the celebrations ended on Thursday with a banquet at Vale Royal. Order Of Distinction A number of medal winners were given National Awards at a civic ceremony held at the National Stadium. Usain Bolt, Asafa Powell and Veronica Campbell-Brown was awarded the Order of Jamaica – Commander Class. Shelly-Ann Fraser, Melaine Walker and relay runners Michael Frater, Nesta Carter and Dwight Thomas; hurdlers Danny McFarlane and Brigitte Foster-Hylton were honoured with the Order of Jamaica – Officer Class. In addition, Glen Mills (Bolt’s coach), Donald Quarrie (200m Olympic Champion in 1976) and Howard Aris (President of the JAAA) were honoured with the Order of Jamaica by the government. The functions included a spectacular gala at which all the athletes were presented to over 20,000 cheering fans. Each of the female medal winners were paraded into the stadium in varying modes of transportation. Simpson posed in a vintage MG sports car whilst Fraser and Campbell-Brown modelled in hand-drawn carriages pulled by bare-chested body builders! Additionally, several junior athletes including World Junior 100m champion Dexter Lee, World Junior bronze medallist Yohan Blake and World Junior relay silver medallist Jura Levy were all handed symbolic batons by Fraser, Powell and Bolt respectively.